If you have received a brand sparkling new computer (let it be Mac/Android/Windows/Linux based) system all of them need some tweaking to make it secure and if you don’t know student geeks tips on this than take a look at LOCK DOWN YOUR PC article. Need to tighten the purse/wallet strings? If you have a Windows Live/ Hotmail email address or creating a new one with your other email address than don’t forget to read how you could take advantage of it on other platforms like Xbox live profiles etc. Find out more at POWER OF WINDOWS LIVE ID! article. Finally got a Windows Phone 7.5 device as a gift! The above articles are just suggestions on possible things you might or might not be wondering about that would be helpful at the moment but there are many more articles from group working to book reviews so explore the site, comment, share, like, rate and tweet about the articles. Looking forward to writing more articles for next year aimed at and interactive on the campus, schools, colleges, clubs around the UK. 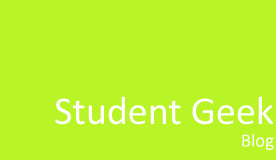 Don’t forget to like Student Geek on Facebook on exclusive content that never gets to make it on the blog, including offers, news and views or join the author of Student Geek on Twitter – Kiran Patel.